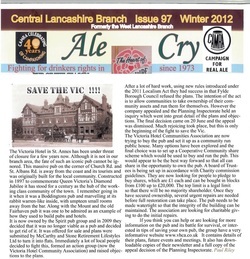 The campaign to save the vic started in 2010 by John Royal who, as a concerned local hearing of the news that the Vic was being sold to developers, began to drum up support from other customers and raise awareness. Sadly, John passed away but the campaign carried on in his name and a committee was formed to formalise meetings and produce an action plan to fight the development. The success of the VHCA committee is due to the willingness of people in the community to volunteer their time and skills. For whatever reasons, the group came together for one purpose - to save the Vic from being demolished and being turned into flats. Without doubt, the Victoria Hotel building is an impressive example of Victorian architecture and is situated within an area of similar styled buildings. However, two thirds of the building has not been used for sometime and has fallen into disrepair and the public house situated on the ground floor is in serious need of refurbishment. The building, with it's car park, covers a large area near to shops and a local school so it is a housing developers dream site and the group knew it was going to be a tough fight. The VHCA campaign committee were conscious that the planning inquiry would want to hear evidence from the whole community and that the community needed to be kept informed about what was going on and how important it was that they contributed by writing letters directly to the Planning Inspectorate or giving verbal testimonies at the inquiry. The committee held Open Meetings at the Vic and at the local YMCA and produced newsletters to keep the local community informed, hear their ideas and answer any questions. The open meetings were also used to give local people templates for writing letters of objection to the Planning Inspectorate and examples of these can be downloaded here. The first planning application by the developers was rejected by the council and this gave the committee more time to prepare a case for the appeal made by the developers. The importance of gathering evidence, testimonials and letters of support cannot be stressed enough as it was the overwhelming voice of the community that persuaded the inspectorate that the Vic is a local asset and that the community should have the right to bid and purchase the property themselves. Campaign efforts concentrated on raising awareness and gaining public support and reconition through postings on the local council comments page and posting appeals and comments on various web networks like this one on the Lancashire Artist Network Support was gathered along the way from residents, local bands like Acquiesce who posted support and links to the e-petition....Significant support, recognised by the Planning Inquiry, from the local Civic Society and the Victorian Society and backing from the local council.........council statement after the decision. Bruce Goodridge interview with BBC Radio Lancashire -He's got a great face for radio! The use of social media was very important to the campaign. The Facebook page helped to get information out and was also used to spread the campaign to far and wide. The success of the Facebook site was mentioned in the Planning Inquiry report as being... 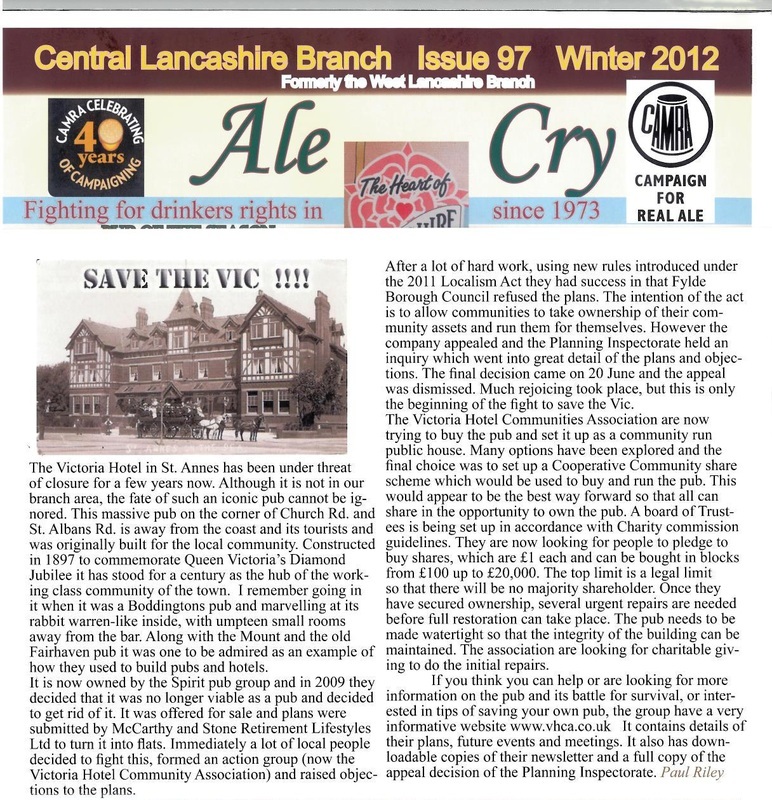 The Twitter account @SaveTheVic quickly built to over 300 followers and was also useful for picking up support, advice and information. homes for older people on the site of the Victoria Hotel pubic house on Church Road, St Annes we have now decided not to proceed with our proposals to redevelop this site. accommodation of this type in the Borough is not in question. if the community are successful in securing it, we wish them the best in their endeavours to keep it open.